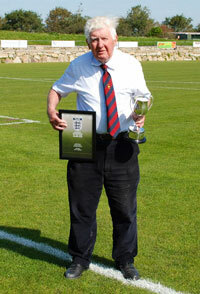 Jack Prowse, Wendrons groundsman was awarded 2nd place in the FA National Groundsman of the Year Awards Ceremony 2009. The category was Step 7 and below. The awards ceremony was held at Windsor Racecourse on September 10th and Jack received his award from Mark Lawrenson. Accompanying Jack were Barry Cudmore (Secretary) and Geoff Lee (Chairman) of the Cornwall FA.